When it comes to high-performance folding wheelchairs, the manual wheelchair Ki Mobility Catalyst5 redefines everything you’ve ever known in the market. Raising the bar in weight, performance, durability and functionality, the Catalyst5 is the best choice of high performance folding wheelchairs. Its customization features make life easier and more accessible. With its 12.9lb of transport weight, the Catalyst5 is meant to take you anywhere you want to go. The manual wheelchair Ki Mobility Catalyst5 comes with the revolutionary “Catalyst Difference” design features, permitting users to fit and adjust the wheelchair to them for a more confident ride. Its innovative and patented frame design built from 7000 series aluminum holds up to 300lbs in weight and provides the chair with an outstanding durability and construction. Enhancements, such as the standard and curved axle plates, give users the ability to adjust their center of gravity, while a frame depth that matches seat depth promotes proper seating position and helps with pressure reduction. With these set of features, users will enjoy an improved turning radius, and easier transportation and storage. The manual wheelchair Ki Mobility Catalyst5 offers a full line of specially designed Ki spoke wheels with precision machined hubs and hard anodized handrims. This gives it a stiffer and stronger wheel resistant to scratching, along with high-performance, lightweight mags for a greater riding experience. 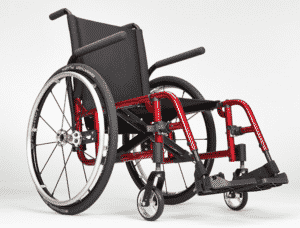 As providers of great mobility products, we are proud to present our customers with the Ki Mobility Catalyst5 manual wheelchair as a ride to exceed all of your accessibility expectations. Contact Orthopedic Service Company today or visit our showroom to find the ideal mobility vehicle suited to your needs.